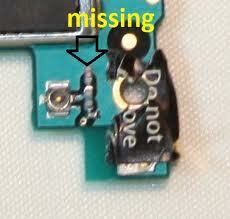 What value is that small part near blue inductor? My iPhone could not get service (BB was always crashing a it got service for maximum few minutes..), so I presumed that if it's low inductance inductor it could be replaced by blob, so I made tiny tin blob over it's contacts.. It helped a lot 70-80% of time I have full bars, but the problem is that it's very picky to location and wether I use GPS or WiFi... For example if I take elevator in malls it lose service and it takes 10-20 minutes sometimes even hour of Searching/1 bar/no service to pick it back.. It seems to pick it instantly if I open phone and disconnect battery and connect it back and turn phone on, but that's really useless when I'm not at home and can't open it up.. So my question is, what is that part I am missing? (http://matteopisani.altervista.org/image...) Is it really inductor? And if it is what value is it, I was thinking about unsoldering blob and either buy it at Farnell or in local "radio shack" or making my own by taking really thin transformer wire and wind it on needle.. But I have no idea what inductance it should have..
Bruno Kremel , the part you are pointing to with you image is L3_RF = 7.5 nH, 5 %, 680 mA, 0.104 Ohms, 5800 MHz SMD/SMT 0402 (1005 metric) Hope this helps, good luck. I have found it on Farnell, is it this http://uk.farnell.com/jsp/search/product... ? Is this blue coil same for 3g / 3gs / 4 / 4s ? Bruno Kremel wird auf ewig dankbar sein.